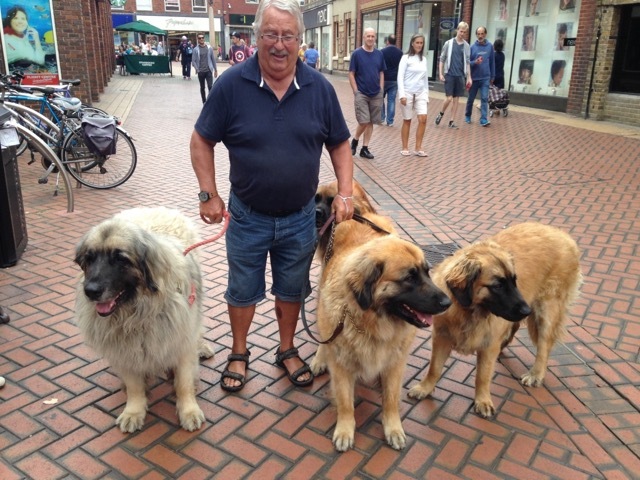 on my travels in Chelmsford I did not see any German Shepherd dogs, instead a whole pack of German Lion dogs. Amazing to see, cuddle and touch. These dogs can be shown in the Working Group such as Crufts, but not at the world Dog show. The Löwchen once had the dubious distinction, like the Portuguese Water Dog and the Havanese, of being the rarest dog in the world. In 1973 there were only 65 registered examples of the breed. Even today, the breed generally has fewer than a few hundred new registrations each year worldwide. To be an excellent watchdog requires some special training. Often called a gentle giant, the Leonberger is serious, eager and willing to please, responding well to training and get along with other dogs. This breed was established in 1846 in Leonberg, Germany, in the region of Wurttemberg by the German breeder Heinrich Essing from a crossing of the Newfoundland, St Bernard and the Great Pyrenees, Heinrich Essing’s goal was to create a breed that would closely resemble the look of a lion. the medium to long, water-resistant, double coat comes in lion-yellow, golden to a darker brown with a black mask which should not go beyond the eyebrows. This entry was posted in Fun on 12 August 2015 by Ilse van Erp.